Three very noisy unidentified flying objects were seen over the town of San Gabriel de Varadero in Loreto, near the town of Yurimaguas in Peru. The event took place on May 16  at 20:00 hours. The UFOs were quite close to the rooftops of the local homes, shocking local residents who had no idea what the objects were. One of the objects was described as being saucer-shaped and with lights "like those of a traffic light". It landed for a few minutes, leaving a triangular mark with three perforations on the surface. Upon seeing them, local residents screamed and asked for help. There were even some who phoned the radio station so that it could, in turn, alert the National Police. An audio recording was made known by Anthony Choy, researcher and host of the 'Viaje a Otra Dimensión' program, containing a call for help made at 21:00 hours, shortly after the UFOs were reported. Beings with non-human characteristics were apparently reported as well. On the recording one can hear the voices of desperate people, and the show host could not believe what he was hearing. An unprecedented event in Latin America. Agripina Wanse, one of the witnesses, stated: "Just as we were about to go to sleep, we heard a noise descending from above. Within this noise was a sound like that of a blender, something like a motor," she said, going on to add: "[They] even lit up the room in which we were sleeping; some lights were being trained on us. We felt frightened and started to scream." Mrs. Wanse said that the objects' color was "like that of a traffic light. Moments later, one of our neighbors, called Herber Chanchari, came by and witnessed the presence of these mysterious objects. They were kite-shaped while on the ground, and when it tried taking off again, it glowed like a traffic light between red and green." Mr. Canchari was shocked by what he saw and reached for his shotgun, firing away at the mysterious UFO. "The shot I fired wasn't like firing at a person, who you can see. It was a machine that suddenly moved elsewhere and the shot went astray." The next day, again at 20:00 hours, another highly luminous unidentified flying object was seen, also quite loud. It came to rest above the home of Mrs. Donilda Lomas, who went out into the street to see what was going on. She witnessed the descent of a luminous humanoid whose height she estimated at one meter and seventy centimeters (5'6"). The luminous being did not touch the ground when it reached it - it was floating." The case caused a worldwide stir due to its characteristics, and also because incidents of this sort had not been reported since the 1960s. 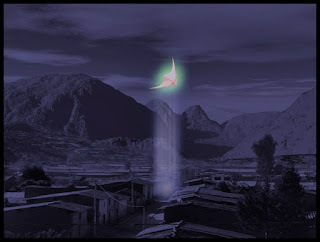 Two days later - on the evening of 19 May - the same story would repeat in El Dorado, Santa Cruz, Bolivia, where the presence of a spherical UFO was reported. [The object] descended from the sky enveloped in flames, and the witnesses -- three youngsters returning home after school -- saw the object come to rest beside a tree. The most interesting detail is that they also saw a humanoid entity with short arms and long legs, whose body appeared to be gelatinous, as though melting away. Researcher Rolando Fabricio visited the site, performing a series of measurements and discovering that electrical alterations were present in the area, possibly accounting for why the locals were unable to contact the police at the time, finding that their cellphones and other electronic devices were dead.